We brought Little A home on a Wednesday. Each of us wound up taking a nap with him on our chests in the following 48 hours. On Friday night, those crazy mid-Atlantic storms knocked our power out. The house was still cool enough to sleep upstairs and Little A was still sleeping in our room. In the middle of that night, who knows what time since our clocks were out, I wake up. In a panic, startled, worried, frantic. Possibly a wee bit dazed from the Percocet. I suddenly realize that there is a lifeless, unmoving mass in my arms. Roughly 19 inches long. And I flip the $#&* out. FLIP THE #^&!@$#%! OUT. I bolt out of bed, as easily as I could, which was not easy since I was only five days into recovery and we have a wicked high bed, and run to turn the lights on, which do not work. I am in total hysterics, thinking I have just SIDSed my own newborn. I cry. I bawl. I am freaking out. FREAKING THE !#$^!~ OUT. CONFESSION TIME. I am 31 years old and I sleep with a stuffed animal. A sea otter, to be specific, though in the past it has also been a teddy bear, a gorilla and a mashed up pillow named Huggy that I stole from my husband in college. Basically, I have to sleep with my arms wrapped around something otherwise I sleep like total crap. And it was at this point, after a minute of sheer panic, that I realize the lifeless thing I am holding has a shitton of fur. And a leather nose. And plastic eyes. And a starfish. But I need visual confirmation. I’m still in a frenzy. And I can’t even find the actual baby. I need light for that. I’m not sure I’m breathing. I try to chill out, take some deep breaths, stumble over to my husband’s side of the bed where I stub my toe on the Rock ‘n Play thingy and hear the gentle snores of a live baby. I am still unconvinced so I reach down to poke it and I am pretty sure I stabbed him in the eye. I am still cradling the stuffed otter I have suffocated, so I give it a squish and mash its face around to make sure it is in fact a stuffed cotton sea creature. Finally convinced everything was fine, I tried to go back to sleep. It must have taken at least 45 minutes for my heart to stop racing. It was one of the worst feelings I’ve ever felt and I feel a lot of feelings. 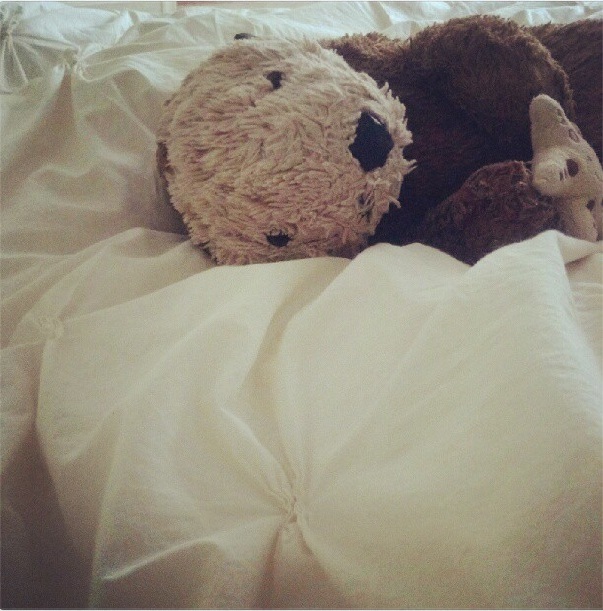 One would think that after said traumatic event, I would just not sleep with the otter. But I can’t NOT sleep with the otter. And that awake-with-a-sudden-panic feeling? Still happens. Every night. At least once. Sometimes I think it’s lifeless, sometimes the crying through the baby monitor makes me think the baby is in the bed. Though I convince myself almost instantaneously that I have only suffocated the otter, it is not pleasant to startle oneself awake every night thinking such horrendous thoughts. But the choice between zero comfortable sleep or sleeping with that grimy ocean beast and panic for 15 seconds a night is somehow an easy choice. It doesn’t hurt that otters, even stuffed ones, may be the only thing that can rival the cuteness of my own spawn. Four months in, and I still wake up every single night in a panic thinking that I have killed the baby. We never even coslept. My husband thinks I’m insane. I’m so glad I am not alone in this nonsensical fear!! I can’t believe it’s already been four months for you, that’s crazy! Definitely reason numero uno we did not co-sleep. I worry I’m going to suffocate my husband with how often I flop around, I cannot imagine worrying about a teensy little thing. I am quite sure this exact same thing will happen to me. Dude. I have only recently stopped waking up in a blind panic about Eebs not moving in her bed. But I still check on her several times a night, sneaking into her room on tiptoes. And there is NOTHING wrong with sleeping with something between your arms. I have 3 small pillows and a new addition of one of EB’s stuffed animals I recently co-opted to get a more comfortable position in the night. It’s science. Ask your chiropractor. I sleep with a tiger named Hobbes. He’s ten years old this year. Anyway, I sleep horrible when I do not have him. Ben makes me pack him when we go places. Last night, Peanut wet the bed. He had almost all of his bears taken from him as they were soaked, I gave him Hobbes to sleep with. Anything to calm a sobbing 4 year old down at 2:30 in the morning. This part made me choke on pasta, and then lose the ability to finish putting the piece of pasta INTO my mouth, so I laughed silently (afraid to choke) with half a chewed piece of pasta hanging off my lip. 😀 Thanks for the laugh! I have no issue napping on the couch with him, or in the recliner in the nursery, but because of these otter events, I will be hard pressed to ever co-sleep in the bed.